The essence of pop art style in its double-digit: on the one hand, an ordinary object, and on the other - it easily turns into art. From the title, it is clear that this is a "popular art", but which for a long time was incomprehensible and not accepted by many critics and art historians. But despite this, pop art style quietly penetrated into the everyday life of Americans, later Europeans then got to us. First in the form of small paintings and sculptures, now pop art style has reached a large scale, and it can be found everywhere - on wallpaper, on textiles, on clothes, in stickers on cars, on posters and signs. Since years pop art style is a very bright and unusual phenomenon in interior design, we decided to formulate several rules according to which it can correctly and harmoniously fit into the interior. And also, selected several groups of objects that best show the pop art style on themselves. Understand the philosophy of style, to create your own version of the interior design, and not just copy the famous samples, will help the story of its creation and emergence. 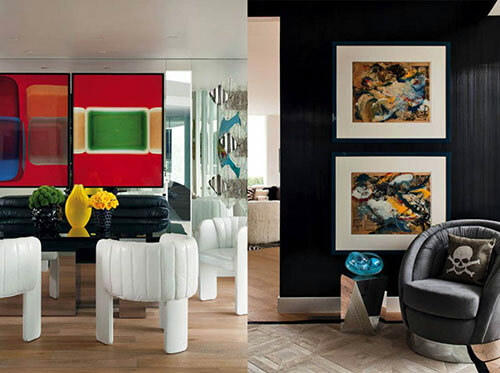 This line of interior design owes its origin to the views of young English artists who contrasted elements of pop culture with the then-modern abstract style of painting and design. The term itself was introduced into circulation by a well-known critic, wishing, with the help of these words, to describe the elements of the emerging modern folk culture, or rather, the popular culture of consumption. Born in the late 50s of the last century on the shores of foggy Albion, pop art style fire spread to America and reached an unprecedented heyday. On the one hand, practical Americans terribly liked the design, which did not require a subtle taste and understanding of the laws of harmony, layout, perspective and other complex things that highbrow architects came up with. On the other hand, the success of pop art style was provided by the impudent and greedy young people, who liked the new principles of decorating living space. What does pop art style conquer fans? First, it's a bright color scheme. This style overturned everything that designers knew about the laws of color combinations on their heads. The pop art style uses bright, artificial colors and shades, connecting in the most inconceivable combinations. If you carefully look at the classical style samples, it can be noted that the riot of colors is typical of furniture and decorative elements, as well as additional items of furniture. The base for the color storm is white, gray or black, which provide the best perception of color experiments. Style does not recognize authority. Moreover, he fearlessly changes the perception of space, experimenting with the shapes and sizes of familiar objects. 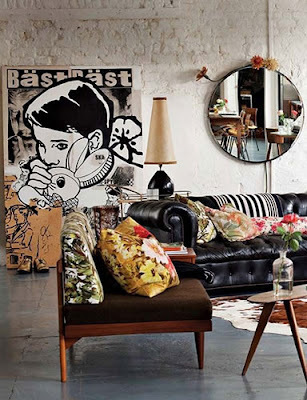 Huge vases-bottles up to the ceiling, tiny sofas that are suitable only for the role of poufs, huge armchairs in the form of cups or glasses for a martini and miniature coffee tables on thin, almost invisible legs are all elements of pop art interior design. Actively used in this design are all the replicated images of the consumer society. Recognizable accessories were bright cans from under the soda, car models, advertising posters. The most popular style marker is paintings or posters with duplicated images, which are repeated in a different color palette. The start of this fashion gave Andy Warhol, who released a lot of works in the style of pop art interior design. The pop art style is a real anthem of consumption. It uses the most inexpensive materials. Paper, cardboard, synthetic fabrics. Most preferably - plastic, which can be called the focus of the philosophy of pop art style. Brightly, brightly, cheaply and quickly it is possible to replace with something else. This style is most interesting with its details, the number, shape, and color of which does not overlap at all. Of the elements that have become truly iconic, you can call the pendant transparent armchairs-flasks, the sofas in the shape of the lips, the idea of which is borrowed from the picture of the great Dali, all the same posters in the style of the works of E. Warhol, the collages of R.
Rauschenberg, from oil paint and newspaper clippings, upholstered furniture in the form of pieces of cake and hamburgers, huge cakes and muffins made from bright, colored gypsum. On the ideas of the pop art style, an entire epoch has been formed and more than one generation of consumers has grown up. Today I used it-I threw it out tomorrow. On this principle, the model of the consumer society is based. It's not about beauty and harmony, just about the effectiveness of the image, which should be bright and, literally, catch your eye. Separate attention deserves the style of the transformation of space, which is also characteristic of pop art style. Original visual solutions, changes in the shape of objects, the use of visual illusions in the design, change the boundaries of rooms, cause the right and left, top and bottom to change places. This is a very characteristic perception of the world under the influence of various means by which the sixties were so famous. the pop art interior design is a completely artificial style that only connotes the wishes of the mass consumer, which, however, did not object too much. As they would say now - a commercial project. Nevertheless, it is still in demand, due to its expression and high intensity of young and energetic energy, the pop art style is very popular among young people. Also, this style is used for decoration of modern art galleries, halls and reception public people in creative professions. 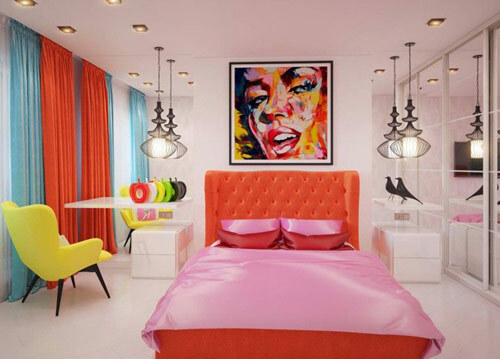 Residential space of pop art style to decorate better with care. It can turn out to be extremely bright, saturated colors and details, and therefore, emotionally tiring. It is better to start with the decoration of the living room, which is not a room of a permanent residence. If for a few months the room will not cause boredom and satiety, then in this style you can make out other rooms in the house. 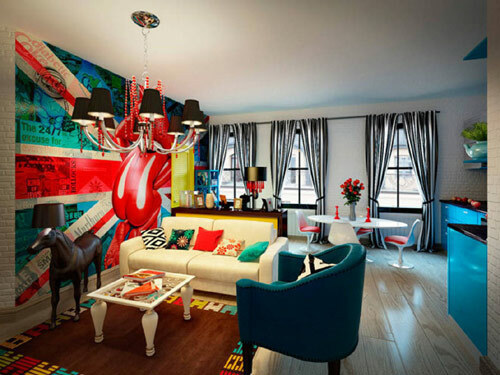 How to create an interior design in the pop art style? Rich in colors and details, stylistics requires the realization of a large space. Therefore, open-plan or simply spacious rooms - an ideal place to create an interior design. If pop art style is planned for a small room, then you will have to confine yourself to a few expressive details that will help create the necessary atmosphere. A brightness of design requires a good and profitable background. Often the walls are painted white. Less commonly used is black, even less often gray. The latter decolorizes colors and smoothes out color conflicts, and this is absolutely not required for a pop-art style room. Floor coverings can be chosen to your liking. Now more often there are white floorboards, a laminate of noble shades. However, taking into account the principles of pop art style linoleum is quite suitable, the ceramic tile of the chess color looks good. From the tile can be made and any other color compositions, especially since it is produced in a large variety of colors. Pop art style allows the use of carpets, especially welcome decorated with abstract or geometric pattern options. 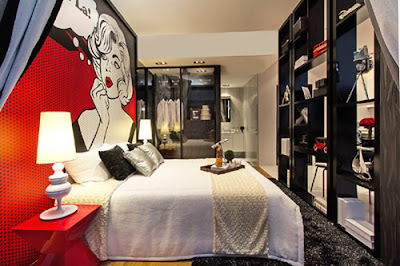 Such coverings came from an active interior fashion, but the pop art style does not take too much into consideration. In the room made in this design, you can not care about the selection of flowers. The more of them, the better, and color conflicts only emphasize the evocative character of the style. So, if you do not want to make a white background, you can choose any other one. Background color can be not one. As for the texture of the finish, it is allowed the most different. It can be combined in any form, join fragments, decorate each wall in its own way, use a cyclic alternation method. One of the most common and recognizable techniques of pop art style is a repeating print. This does not necessarily have to be an ornament or a pattern. A portrait of a famous person, an advertising slogan or logo, another recognizable advertising image will suit. With this print, you can draw one wall or a fragment of it. The ceiling is multi-level, with multi-colored lights or neon lights. If the issue with the coating is solved, it is better to choose stretch glossy ceilings, since pop art style very much loves shiny surfaces. Despite the love of unusual accessories, the pop art style does not like overloading with furniture and objects. Therefore, filling the interior design should be restrained. Required minimum, not more than that. The smaller the room, the less furniture there will be required. 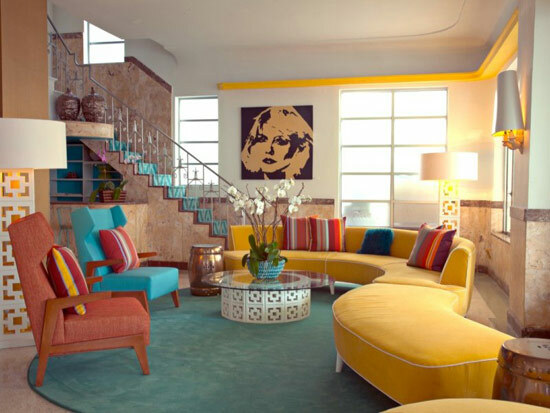 the pop art interior design is prone to free spaces. But in forms, colors, and sizes you can not limit yourself. 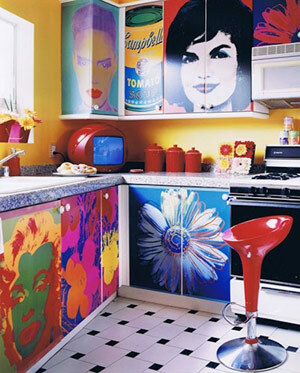 Despite its brightness and freshness, pop art interior design has a solid age and quite naturally tends to elements from its past. Hence the love of retro-futurism. Everything that was fresh and sharp 60-70 years ago, pop art style sentimentally preserved to this day. Pay attention, cabinets in the pop art style are not available, as a class. For storage, you can arrange a rack in a niche, with bright container-boxes. For things and shoes have to look for a place under the dressing room. In the worst case, the built-in closet will help out. The style of furniture should be close to the 60's. Bright sofas, multi-colored plastic tables, and chairs of the most incredible shapes, pendant chairs will fit perfectly. 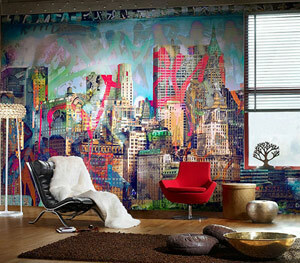 The surface of furniture, walls, mirrors or glass of this room can be decorated with real graffiti. If there are a desire and talent - do it yourself, but no - hire someone who knows. With this stroke, you can immediately set the desired vector in the perception of the room. The real mood of the room is, of course, attached to accessories. Among them, the posters, paintings, and drawings occupy the first place. They are executed in the same style, although sometimes you can see abstract paintings, this is a tribute to fashion, not style. Very popular are portraits of celebrities. It can be characters of the history of the 60s, actors, politicians or other public people. You can decorate the interior with portraits and modern figures, but for this, they must be truly cult figures. Posters with photos of celebrities are distinguished by the same recognizable style and brightness of colors, as well as by repeating the pattern in different shades. 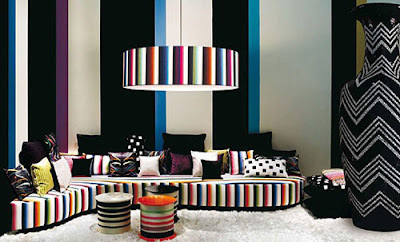 Textiles for decoration should be bright, it can be combined or monophonic. Pretty flowers look rather original, although ethnic motifs are not typical for pop art interior design. Excellent looking inexpensive plastic accessories with bright, neon color or non-standard form. They are complemented by metal and leather elements, and in the last few years they have been adding accessories from transparent glass, for example, lamps in the form of a series of hanging balls, a set of simple bottles, like the milk we know, only in different sizes. In order to give a really original look to the room of pop art style, you can take advantage of the possibilities of hand-made. This style is very fond of any manifestation of creativity, especially, independent. Any banal thing can become a work of pop art interior design. In order to give your needlework a suitable look, use bright, recognizable advertising or mass media images. For example, the heroes of famous serials, commercials, popular brands of food and beverages. They will fit perfectly into the interior design. this ideas and ways of expression of pop art style flowed smoothly and imperceptibly into modern advertising, forming its philosophy and largely influencing the style. 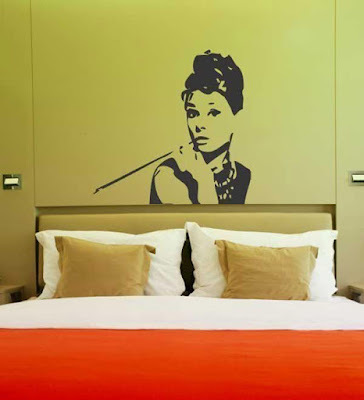 The main feature of pop art interior design is its unconditional availability. It does not require expensive furniture or furniture to order from you. All you need, you can buy at the nearest furniture supermarket, and make decorative elements and accessories yourself, to the best of their creative and financial capabilities. Recently, the tendency has not been to fully devote the entire interior to pop art style but to add its accessories to other styles. For example, in the loft, fusion or contemporary. This is due to the lack of space, and the complexity of pop art interior design for long-term perception, yet for everyday life, he is overly flashy. Expressiveness, brilliance, rebelliousness and democratic accessibility - this is the reason for the popularity of pop art style for many years. Thinking of making a room in this style, you can be sure that as a result, you will not be bored in such a room. The color and design of the ceilings support the main idea of the style - gloss, and glamor. 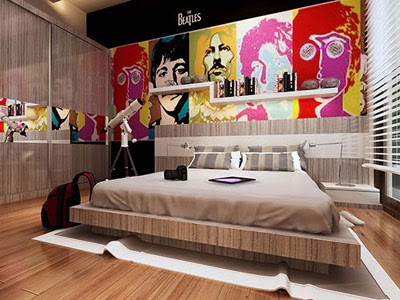 Ceilings of pop art interior design are light and glossy. They can be hanging and tensioning. Suspended ceilings can have several levels. The asymmetric niches in them are lighting with multi-colored neon lamps. Ceiling lamp of unusual shape may well become a composite accent of the interior design. Pop art style offers two traditional options for decorating walls. - Solid white. In this case, they are the background for various color accents - panels, paintings, posters, photographs. - Colored. The walls carry a stylistic load, so they are decorated in contrasting colors. 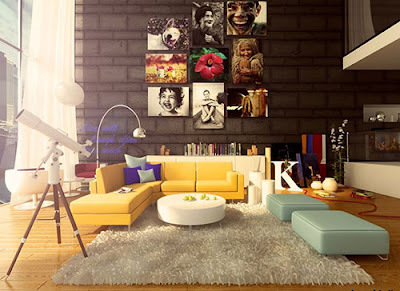 The brighter and more shocking the combination of colors, the more interesting and stylish will be the room. In the decoration of different walls, different materials are used. Walls can be painted, wallpapered on them, covered with decorative plaster. On one wall you can apply the principle of cyclic composition. In this case, one small decorative element or pattern will be repeated many times. It can occupy the whole wall. Organic wallpaper with an optical illusion, depending on the angle of view, the picture either changes or disappears. The design of the floor of pop art style is difficult. Allowed the device and even the podium lighting. The color solution can be different. - Neutral scale. Serves as a backdrop for a bright interior design. But such floors can be boring. Add brightness to help carpets of unusual shape or texture, for example, zebra skin or jaguar. Floors carry a stylistic load. In this case, a bright ceramic tile laid out in a chaotic manner is used. As a floor covering, a laminate or carpet of saturated colors is also chosen. Pop art style rejects deliberate luxury and tradition. Cheapness is one of the principles of this style. Heavy cupboards and sideboards clutter up space, they are not acceptable. Will be niches, built-in furniture, pull-out beds, sofas-transformers. Furniture should not be much, but each model must be original and trendy. Cabinet furniture is small, its parts can be interconnected in the most bizarre way. 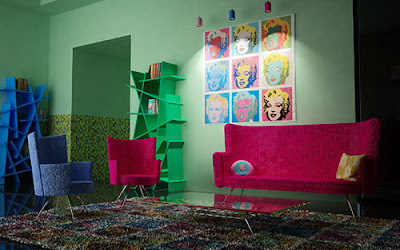 For pop art style is characterized by bright sofas and multi-colored puffs. Forms - round, soft, materials - synthetic. The invention of pop art style is plastic furniture. It should amaze with color and shape. An indispensable attribute of furniture is a glossy or glossy surface. Decorating simple furniture to your taste is welcome. In the pop art interior design, accessories and details are of paramount importance. In fact, it is they who determine this style in many ways. The most characteristic element is the portrait of Marilyn Monroe by Andy Warhol. Repeating symbolism is one of the main ideas of the style. There are all kinds of plastic items, original sculpture, lamps made in the form of Hollywood movie characters, posters on walls, furniture, and fabrics, photos of celebrities in the original frame, intricate glass or plastic vases. Items created with their own are welcome. In addition to plastic, popular materials are glass and paper. For decoration of the interior design, drawings or paintings that evoke a mystical state or hallucinations are used, creating the so-called psychedelic effect.